Most of the black bean recipes I’ve tried have been pretty ordinary until now. If you like a little sweetness with a bit of spicy, this recipe fits the bill. In fact these beans are great served with any of my other Mexican recipes. Try substituting these for refried beans for a little variety to accompany your enchiladas and spanish rice. This recipe can even be served over brown or white rice and a dinner salad for a complete meal. In the mood for a vegetarian taco? Fill a soften corn tortilla with these beans topped with some cheese and you have a great lunch. So now that I’ve tickled your taste buds let’s give these a try. Heat the olive oil in a frying pan over medium high heat. When it’s hot add the onion and stir. Cook the onion for 20 to 25 minutes until it cooks down to about half of what you started with. You are looking for a nice golden brown color. You will probably need to turn the fire to low after a few minutes. Stir frequently so they don’t burn. While the onion are cooking, chop up your jalapeno and garlic and set aside. Drain and rinse the black beans. In a large pot add the beans, diced tomatoes, honey, brown sugar, ginger, and salt. After 20 to 25 minutes of sauteing the onion, add the jalapeno and garlic. Mix in well. Continue to cook 5 minutes longer, stirring frequently. Now add the onion mixture to the pot of beans and stir. Heat over medium heat until hot. Side note: You don’t necessarily have to cook the onion for 20 minutes BUT in my opinion, this will make your dish if you do. Those golden browned onions will impart a wonderful sweet flavor you won’t want to miss. 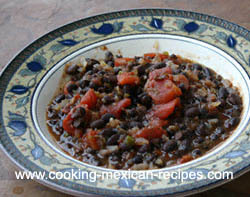 Now serve up that sweet and spicy black bean recipe in one of the recommended ways I described above and enjoy. Watch my video for how to make my black beans recipe. Looking for a refried bean recipe?